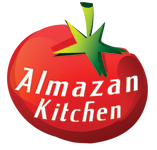 Are you ready for the most unique and special Almazan’s pizza that you ever saw? It is featuring premium homemade Serbian prsuta that is cured for 3 years under special conditions and fresh mozzarella cheese made from Serbian buffalo milk. You cannot buy that stuff, only make it by yourself and we made ours in the forest, same as this pizza that we baked on coals in our improvised oven…Do not hesitate to try it out, you definitely will learn something new! Mix 1 tbsp. of fresh yeast with 2 tsp. of sugar and ¼ cup of milk. Mix step No. 1 with 1 hand of flour, ¼ hand of water and ¼ tsp. of salt. Smash and grind few green chilies with handful of rosemary, handful of thyme and 2-3 garlic cloves in the mortar using pestle. Add 1 tsp. of olive oil. Mix well! Preheat the pan and clay lid. Attenuate the dough into the pizza shape. Do not forget to use flour to prevent dough from sticking to hands and cutting board. Place the pizza dough into the pan. Cover the attenuated dough with special Almazan pizza sauce and 150g of fresh mozzarella. Cover with lid and cook until dough has crispy crust and cheese is melted. Sprinkle with green pizza sauce. Add 150g of Serbian prsuta. Finish off with some fresh rockets. How do you make your yeast? Looks amazing!